"At the start of this project, it looked like the nucleobases in these meteorites were terrestrial contamination — these results were a very big surprise for me," study lead author Michael Callahan, an analytical chemist and astrobiologist at NASA Goddard Space Flight Center, told SPACE.com. 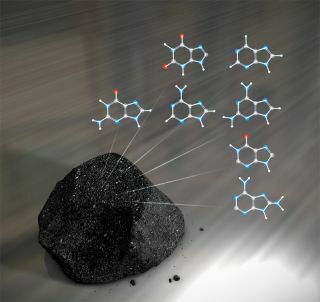 Lab experiments showed that chemical reactions of ammonia and cyanide, compounds that are common in space, could generate nucleobases and nucleobase analogs very similar to those found in the carbonaceous chondrites. However, the relative abundances of these molecules between the experiments and the meteorites differed, which might be due to further chemical and thermal influences from space. "All this has implications for the origins of life on Earth and potentially elsewhere," Callahan said. "Are these building blocks of life transferred to other places where they might be useful? Can alternative building blocks be used to build other things?" In a different study, researchers discovered molecules that make up key parts of a vital biological pathway, the citric acid cycle, in a number of carbonaceous chondrites. The citric acid cycle is "thought by many experts to be among the most ancient of biological processes," study co-author George Cooper, a chemist at NASA Ames Research Center, told SPACE.com. "One function of this cycle is respiration, when organisms give off carbon dioxide." "It is always exciting to find extraterrestrial and ancient 4.6 billion-year-old organic compounds that might have had a role in early life," Cooper added. Cleaves, Cooper and their colleagues detailed their findings in two studies online Aug. 8 in the Proceedings of the National Academy of Sciences.